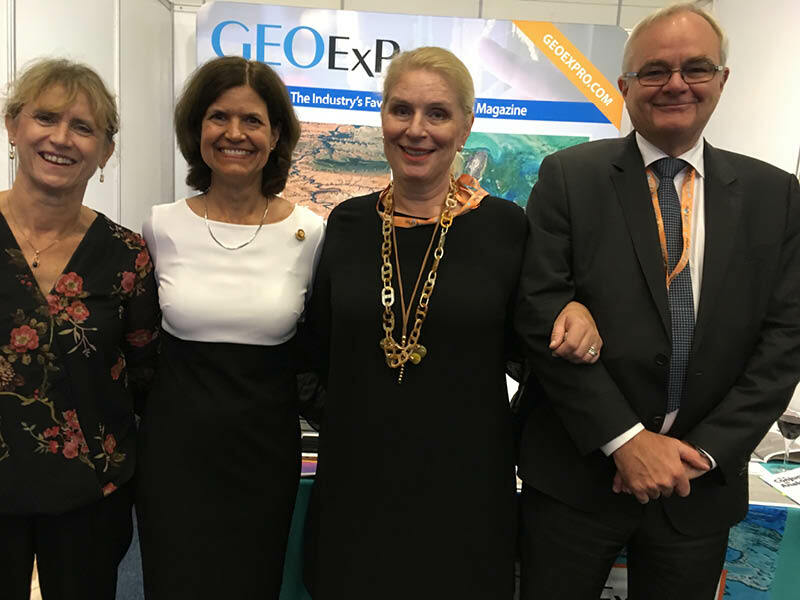 Left to right: Jane Whaley (Editor in Chief GEO ExPro), Denise Cox (AAPG President), Kirsti Karlsson (Sales & Marketing Director) and Tore Karlsson (Managing Director GEO ExPro). 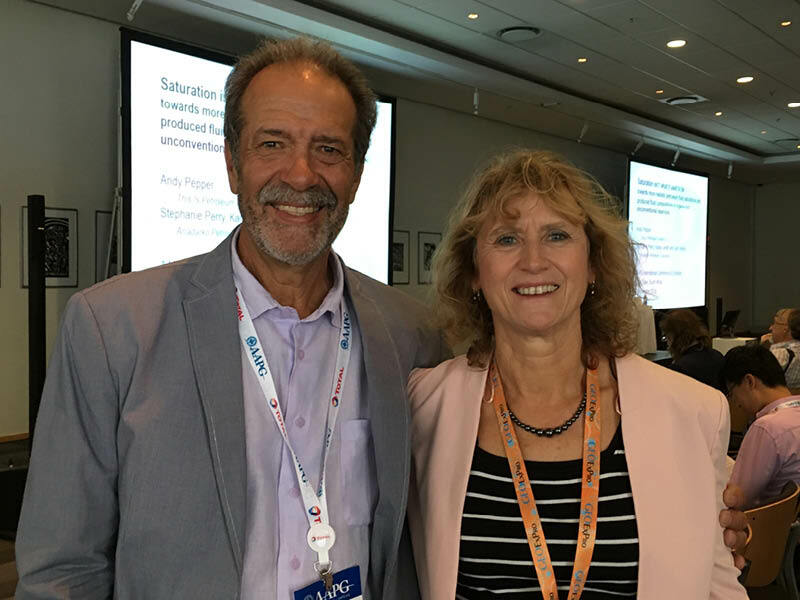 This year the American Association of Petroleum Geologists (AAPG) chose to hold its annual international conference and exhibition (ICE) in the delightful city of Cape Town, home to the annual Africa Oil Week. The two organisations got together and decided to develop the synergies between them by holding both events in the same week in the same venue: a brave experiment, but one which I think worked quite well. The two conferences, both with a major focus on the African continent, are complementary in style and programme, and while there were some areas of overlap, the content managed not to appear repetitive, so the organisers are to be congratulated for that. There was a significant increase in the number of delegates at AOW over 2017 and with the increased oil price over the last 12 months (although it has dropped over the last few weeks), the mood at both events was definitely positive. 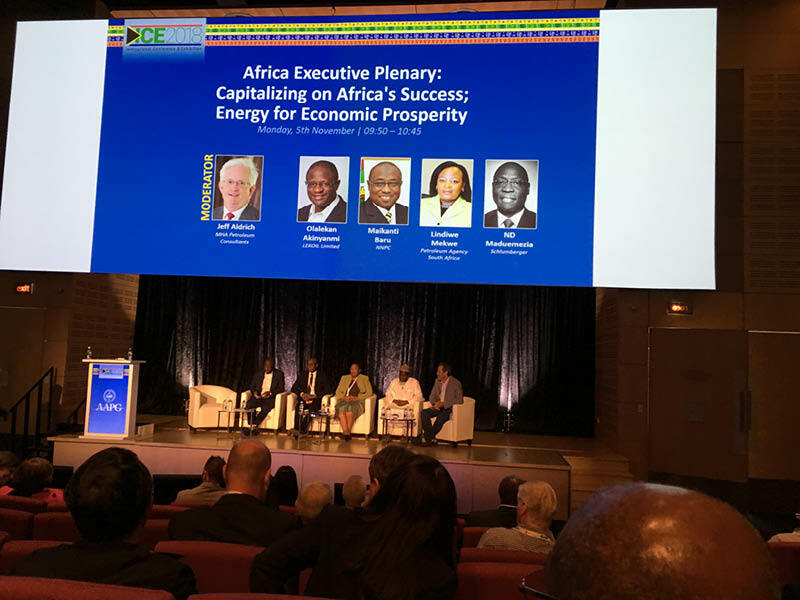 The events were held in the Cape Town International Conference Centre, with Africa Oil Week (AOW) starting a day later than ICE and continuing for a further two days. Since they were on different floors, one minor disadvantage was that there seemed to be a lot of running back and forth, both for the exhibitors and between presentations for the attendees. AAPG ICE 2018 Africa Plenary Session. The AAPG conference, which started with the opening ceremony on Sunday 4th November and ended on Wednesday 7th, is the more technical of the two, with an emphasis on ground-breaking geoscience and technology. Session themes for talks and posters ranged from reservoir characterisation modelling, well placement and sequence stratigraphy to basin scale and regional petroleum systems and exploration. The overall theme of the conference was ‘Shaping the Future in a Changing Energy Landscape’, so while these sessions were technical with an academic focus, there was also a number of panel forums and plenary sessions to provide wider discussion opportunities, which proved both stimulating and thought provoking. These included debates on subjects as wide-ranging as global energy supply and demand, and capitalising on African success. I found the ‘Big Data, Big Ideas’ session particularly interesting, listening to panellists and audience discuss how the latest ideas in machine learning need to be harnessed by the industry. 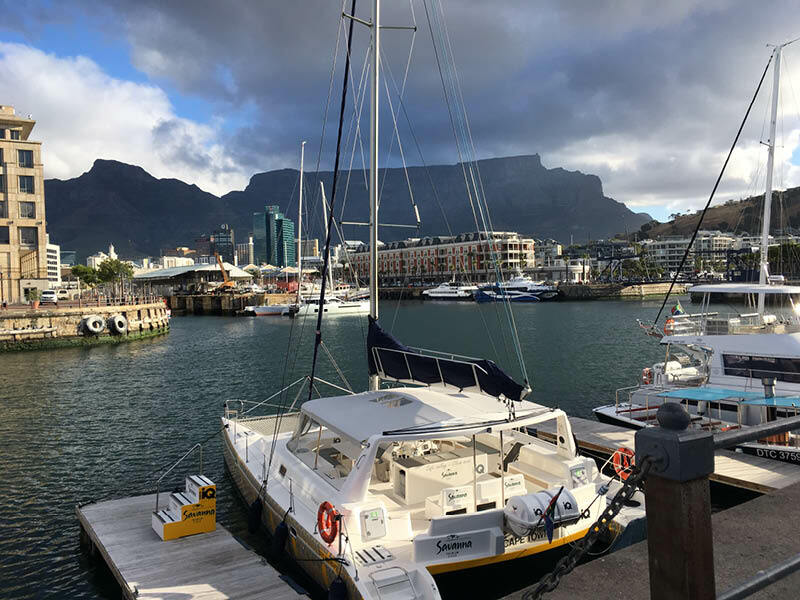 The unmistakable and iconic view of Tabe Mountain from the V&A Waterfront in Cape Town, South Africa. A representative from Saudi Aramco pointed out that in many ways we need to throw out much we have learnt before and start again – before we drown in data. Much of the discussion on this topic is led by the majors and other large companies, so it was good to have input from the relatively small independent Cairn Energy, explaining how they go about this process with a lot of collaboration with other organisations. An equally fascinating AAPG forum tackled E&P and the environment we live in, with presentations covering such varied topics as carbon capture and storage and reducing the effect of seismic on marine life. Timi Familusi spoke about the major conundrum of Africa, touched on by several speakers at both conferences: how to improve the poor levels of access to electricity and clean cooking methods in Africa while not increasing the amount of CO2 in the atmosphere by producing more hydrocarbons - and how to counter the inevitable negative public viewpoints? Zondwa Mandel presenting at the 25th Africa Oil Week anniversary party in Cape Town. 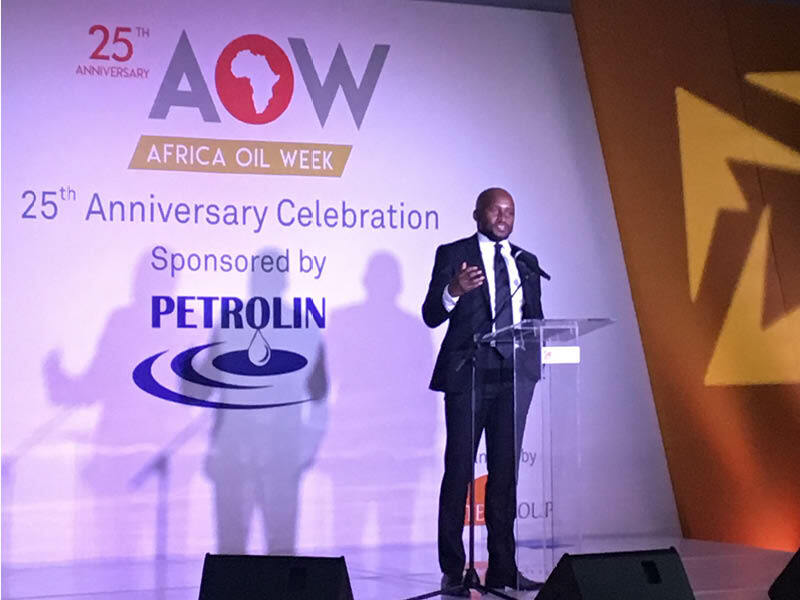 By contrast, the Africa Oil Week programme had a much wider and more business-oriented remit, composed primarily of plenary panel and Q&A sessions with strong line-ups of distinguished speakers, many from the ministerial and CEO level. These included presentations during the opening ceremony from, among others, the South African Minister of Energy and the Executive Director of the International Energy Agency, who had an important reminder: the high oil price is good news for oil exporting countries, but obviously bad news for the ones importing oil, especially in Africa where many of them are struggling with inflation. A variety of panellists were interviewed by well-informed interviewers, predominantly from the industry but including the BBC’s John Simpson, on topics ranging from Africa’s role in the future energy landscape, developing national roadmaps and strategies, and future business models. Sometimes these topics seemed a little close to each other and there was some reiteration – but the panel style of the event inevitably means that what is said is relatively spontaneous, so that is not really surprising. Events in the main hall were introduced and facilitated by broadcaster Henry Bonsu, whose lively and engaging manner certainly added extra life to the proceedings. Several African countries, including Madagascar, Republic of Congo and Uganda, took advantage of the occasion to announce bidding rounds or report on developments in existing rounds. Ghana announced the opening of its very first licensing round to a packed room of delegates, and all these sessions seemed very popular. The AAPG and AOW organisations combined forces with the Prospect Forum, where 14 African countries and about 20 companies presented blocks and other opportunities available to interested parties. The calibre of the presentations and the blocks and areas on offer was very high, and these talks seem to gather considerable attention. AAPG ICE 2018 Panel Session on global diversity - seven women and one man. Both organisations also had events dedicated to encouraging more diversity in the industry. 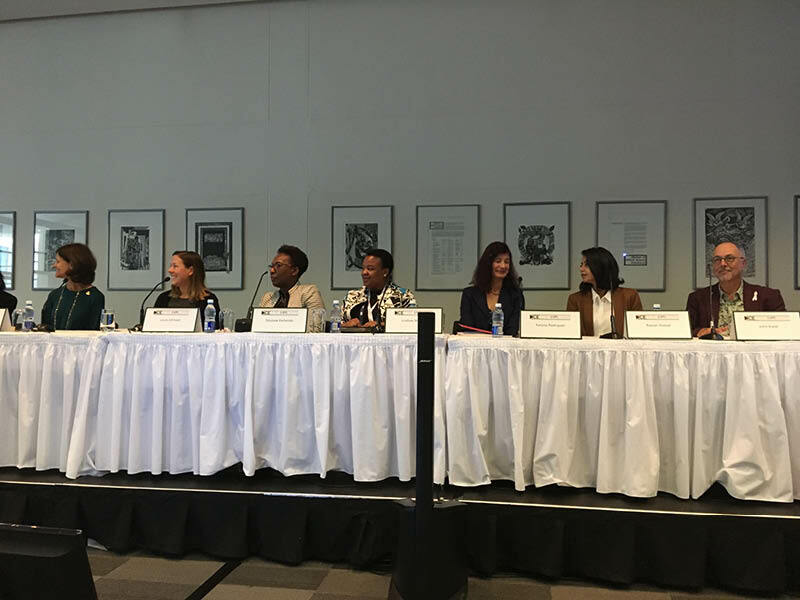 Unfortunately, I was not able to attend the AOW Women’s Breakfast, where pioneers, stateswomen and business leaders were set to discuss the importance of robust roadmaps for gender equality and youth empowerment in order to encourage the next generation of global energy leaders. I am sure this was as well attended and stimulating as the AAPG session on Diversity, entitled Transforming the Petroleum Industry and Adding Value through a Globally Diverse Workforce, where a panel of seven women and one man discussed the importance of diversity in the workplace and how it has – or hasn’t - been a factor in their working life. While many of the points have been raised at such events before, there were still new viewpoints and conclusions to be drawn from the discussions. 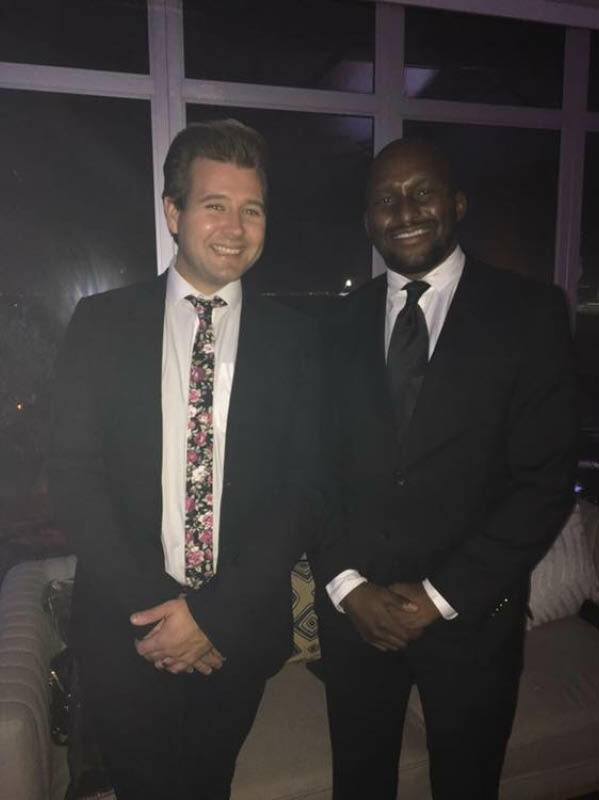 Sales and Marketing Manager and Digital Editor, Nathan Young-Ziolkowski with Zondwa Mandela at the Africa Oil Week 25th Anniversary Party. Conferences can’t just be hard work, and this was no exception. There were a number of networking receptions and events, including the AOW’s 25th Anniversary party, held at The Lookout, a beautiful location overlooking the sea near the Waterfront docklands development.Guest of honour was Zondwa Mandela, grandson of the father of modern South Africa, Nelson Mandela, who gave an inspiring speech about equality, collaboration and family. At the same event we were entertained by an excellent acapella trio The Soil, imported all the way from Johannesburg, who were a fantastic lively and musical experience. Other highlights included the vibrant choir at the AAPG opening ceremony, made up of children from the local townships; such musicality, rhythm and harmonies in youngsters was wonderful to experience. I also really enjoyed the lunchtime talk by geologist PV Scaturro about his descent of the Blue Nile in 2003-4: two men, three boats, hundreds of rapids - and a whole lot of guts, luck, and kindness from strangers. The iMax film they made of the adventure Mystery of the Nile is available on Netflix, apparently: well recommended. Editor in Chief, Jane Whaley, pictured with PV Scaturro. Perhaps one of the most significant inputs to both conferences didn’t come from a geoscientist or even from an oil industry person at all; it came from palaeoanthropologist Lee Berger. His talk at the AAPG opening ceremony about his work on hominoids, complete with a tale of a nine-year old making a discovery that had eluded scientists for years, descriptions of huge numbers of humanoid bones lying deep within a very tight cave system (the claustrophobic among us were not keen on those photos! ), and his many findings that have turned accepted science on its head was truly inspirational. As was his concluding remark: never stop exploring! (Below) South African A Cappella Group - The Soil, performing live at the 25th Anniversary of Africa Oil Week, Cape Town. GEO ExPro articles related to or similar in content to hydrocarbon exploration and production in Africa.